Do the Amish try to recruit outsiders? Yes. It is rare however. Even rarer is the outsider who joins the Amish, and remains Amish. Unfortunately, many who join end up leaving the church. One report suggests that out of roughly 300 who had joined over an extended period, only about one-third had remained Amish. Reasons can include disillusionment with Amish life and the very human members of Amish churches, joining for the “wrong” motives such as non-spiritual reasons, difficulty adapting and feeling a part of the community, and difficulty leaving behind modern technology or individualistic trains of thought. To join the Amish, typically, one would first become acquainted with Amish, often in a community which is “seeker-friendly”. Spending time living in the community, attending church, and participating in community events for an extended period of time is a must. It’s rare that outsiders become and remain Amish. Members of the church would need to support the candidacy of the individual to join. Learning the Amish German dialect is necessary as well. After an extended period of time, when both sides are satisfied that joining the church is the right decision, a person may become a candidate for baptism. Can you keep in touch with your family if you join the Amish? Amish people maintain relationships with non-Amish people, so there is no reason that a convert wouldn’t be able to maintain contact with their non-Amish relatives. However, with the lifestyle and often location change involved, contact with non-Amish family may become less frequent. Additional strain can emerge if family does not fully support the decision or has limited understanding of Amish ways. To read about one family’s account of a son joining the Amish, you can read the story of Anne and her son Ed, documented on this site in a series of posts (first post here). You may also like the story of Marlene Miller, who joined the Amish at a young age and has remained a church member over 45 years later. No, Amish do not actively seek converts like some other Christian groups. Practically speaking, becoming Amish is very difficult for outsiders, due to differences in culture, lifestyle, and mindset. Amish believe in quietly witnessing by raising their children within the faith and living Christian lives as best they can. Despite the fact that Amish do not try to recruit outsiders, some non-Amish have successfully joined and remained members of Amish churches. Some churches are more open and accommodating toward spiritual seekers than others. Unbaptized Amish children and youth are technically not considered members of the church. Amish youth usually join the church between the ages of 18 and 22, though some may join at a younger or older age. Candidates for baptism must take instruction classes over an eighteen week period. Read more on Amish baptism. Miller, Marlene C. Called to Be Amish: My Journey from Head Majorette to the Old Order. Harrisonburg, VA: Herald Press, 2015. To Cite this Page: Wesner, Erik J. “Joining the Amish.” Amish America. Erik Wesner, 20 Feb. 2015. Web. [Date Accessed]. 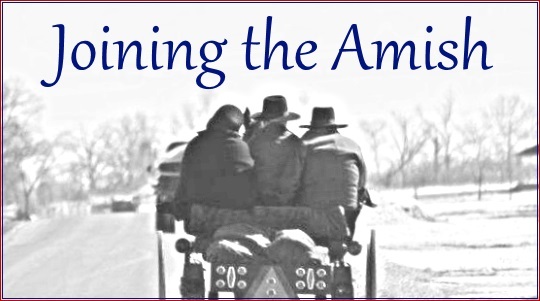 <http://amishamerica.com/becoming-amish/>. As I follow many of these threads about joining the Amish, it occurs to me that many people who are led to seek fellowship with an Old Order group may not be looking far enough. There are other Old Orders out there that are much more approachable than the Amish. The Old Order River Brethren and Old German Baptist Brethren groups come to mind. These groups are very open to outsiders and both have numerous members who were not born into the church. Both are very conservative, plain dressing, English speaking(no need to learn a new language) and both have smaller brotherhoods that are horse and buggy for those being led that way. Thank you for the wisdom you have shared on your knowledge of the Amish. I grew up in Western NY mocking the Amish and never truly understanding the culture. Without giving my testimony I am a saved Christian (real Christian) but I am bound by the laws of evil doers that I cannot separate from legally and as I do not wish ever to “tempt thy Father” and feel I am doing so by continuing a job as it is the only time I leave my home. I live only to study with my wife as she knows and has submitted to her Head but we wish to either donate or sell everything we have to donate to the Amish Church as we are not looking to be freeloaders. We have no use for money and we look only for a justified life where we earn what we have to remain humble and not over abundant. I know physically it will be a change to transition from the liberties of a lost world to following the word of God 24/7 and this is why we look to join. We are both spiritually ready and wanting to leave this world completely. Where would I begin to even look? We are currently in South Florida and that is the issue. I know of a guy that lived with them and pretended he was going to join to avoid the law. Are the horse and buggy Mennonites similar when it comes to Converts? Yes, the Old Order Mennonites (horse and buggy) would be equally difficult to join. There are car driving Old Order Mennonites as well. The same obstacles as with the Amish would be present with the OOM. If you seriously consider to join the Amish, you should read this Wikipedia article: https://en.wikipedia.org/wiki/Seeker_(Anabaptism) This article contains a lot of information for seekers who want to join an Old Order group. observation on few common things, The web site style is ideal, the articles is in point of fact nice :D.
If you are a single mom can you still become amish? MY MOTHER & I HAVE WANT TO LEARN HOW TO BECOME AMISH, IS THERE A FAMILY OUT THERE WHO WOULD TAKE US IN/UNER THEIR WINGS TO HELP GET US INTO AN AMISH COMMUNITY? Searching for a certain Amish Gal. It does help to become a part of an Amish family to have acceptance in there faith. I am from north central Indiana and there is a certain Amish Gal I once knew who had an interest in me but at the time, the time was not right for me. I don’t remember her name but she used to work at The Cheese Hause for a long time which is between Middlebury and Shipshewana Indiana. She frequently worked as a cashier at the Yoder Consignment Auction and The Haiti Benefit Auction. She was kind of tall, frequently wore light colors, dark hair, and big beautiful smile. By now she is probably in her 40s. Last I knew, she was still not married. She did act very Christian and committed in her faith. It would probably not start as anything serious but who knows. Just have dinner, walks in the park, and some devotional time. If anyone thinks they know who I am talking about then respond or even let her know about this so that contact can be made. need help in becoming Amish immediately!!! Good evening, everyone, I’m writing this because, since 2009, I have wanted to become fully, 100% Amish. I have been, for years, completely ready to totally leave English/mainstream American life permanently, And to go live in an Amish household, perhaps as å hired girl. I am 40, childless, already Christian, already believe in The Amish faith, don’t use that many high-tech things, and already dress Amish. I did ask an Amish girl, through å postal letter å few years ago, if she could help me find an Amish person to talk with who would get me started, but my question was completely ignored. PLEASE, I want so badly to become Amish NOW!! !I am sick of waiting!!! Is there even one person who can introduce me to some Amish people who would be open to me? I especially need help because I am extremely shy. Please, someone help me to become Amish!!!@! The Amish won’t come looking for you — you will have to go to the Amish. I feel sorry that you are shy but if you can’t take the steps to take action, nothing will happen. It is not an easy change to make and overcoming shyness is just the beginning. ISimple &amp; Plain is Peace. I could & would grasp the Amish Life with Joy & Peace, but I am divorced & remarried. I am a conservative Christian & believe & live plain & simple. Debt free, no electricity, no car, conservative, plain clothes. I actually had a minnonitte friend to make me some conservative dresses like the Amish wear as my friend also wore. I’m still yet to learn sewing. Also my husband is not in agreement with how I believe. I have my phone still but no other technology. I have lived the simple life almost 5 years now. Although I attend the modern church with my husband I don’t agree with so much. I feel out of place so much of the time. Our lives are so different. Sorry I miss spelled My comment title. address to you, with my permission.